Civil Hands is the secret love-child of REM, Pearl Jam and the Cranberries, hand-crafting indie-rock musical tales with a dash of joyful pop. They have taken their sound on the road throughout the Central West to venues in Mudgee, Forbes, Parkes and Orange, and further afield to Sydney and Canberra stages. They have played on festival bills at Inland Sea of Sound, Tunes on the Turf and Dubbo’s Dream Festival. Their debut album, Leave It All Behind, was launched at the Old Dubbo Gaol with a music/art/video experience that included projected moving images from local artists. 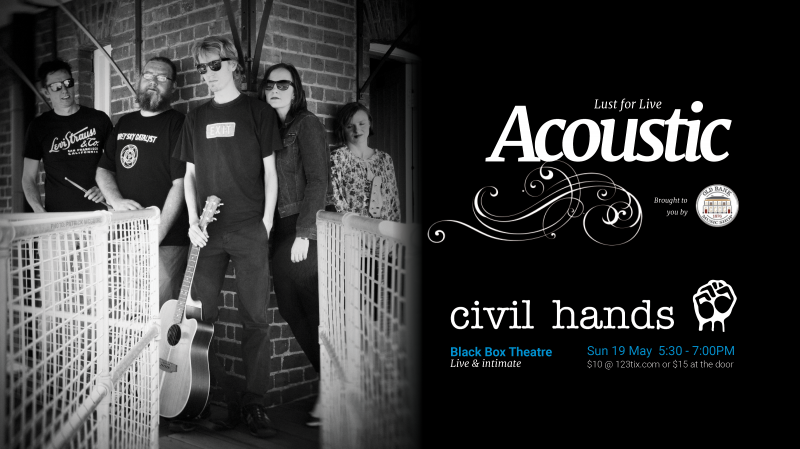 This special May performance from Civil Hands will include a collection of brand new tracks as well as a few familiar tunes. Doors open at 5:30pm, with bar available. SOMAD (Songwriters & Original Musicians Association Dubbo Inc) is a grassroots not-for-profit incorporated association founded by Dubbo musos with the aim of transforming Dubbo into a Music City.